This is NOT a camellia, it is a rose. I never cared about Camellias until I started reading Eudora Welty's gardening letters (Tell About Night Flowers: Eudora Welty's Gardening Letters, 1940-1949, edited by Julia Eichelberger). I thought I knew all I needed to know about them. My daily iced green tea is made from the leaves of Camellia sinensis and those grown for the flowers, generally Camellia japonica, are not hardy here. Not hardy here. Camillias are generally hardy in Zones 7 through 9. I am in Zone 6a, formerly Zone 5b. Not hardy here, still. I did a search online and found that people are attempting to grow them in Zone 6b, but did I mention how much fussing and coddling Eudora Welty seems to have done with her camellias, and she lived in Mississippi in a zone where they are hardy? They seem like such touchy plants. Any sudden changes in temperatures, watering conditions, humidity or whatever and the Camellias sulk and drop their flower buds. And they don't like to be moved. But they are a long-lived shrub, apparently. I only know that from what I read. Eudora did send a potted camellia to her literary agent in New York and often wrote him asking how it was doing. She wrote in one letter, after he wrote telling her how sickly looking his camellia was, "The camellia sounds awful! Did I warn you, I should have, that if it arrived with the ball of earth cracked or disturbed, to send it right back? 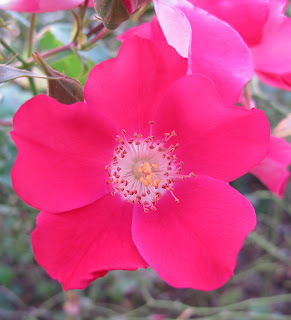 You read about plants "resenting" being disturbed, or even "highly resenting" but that is pale beside what camellias feel -- they all but put an arm out and hit you if the ball is disturbed and if it breaks that is fatal." I only know what I read but grown inside, camellias seems to also attract every known insect that attacks indoor plants - aphids, white flies, scale, mites, and mealybugs. Plus, see above about not liking any sudden changes in watering, humidity, or growing conditions in general. One week of forgetting to water and the camellia would sulk and drop its flower buds. I have the good sense to know that in my sunroom, a camellia wouldn't last long. See above about sudden changes in watering, etc. But I keep reading Tell About Night Flowers and Eudora keeps mentioning camellias. So I keep thinking maybe I should try to grow a camellia. Maybe. I keep thinking that those flowers must be something special for all the fussing and fuming and coddling Eudora and others seem to have done to get their camellias to bloom. Maybe I should give one a try. Just one. Inside. Or outside? Maybe. They are lovely flowers and not only do they need a warmer climate, they require acid soil....they died in my garden. I have one camellia in my garden and might add more if this one blooms well this coming winter. We shall see. I can see how you would be tempted. Camellias are easy plants here in coastal California, surviving even our hot summers and dry Santa Ana winds with little in the way of care. It wouldn't have occurred to me that they can be difficult in your area of the country if I hadn't read your post. But then you can grow things that I can only dream of too. I hope you can make a go of one inside. Hmmm...perhaps "fussy" tells you more about Eudora than it does about camellias. Both the japonicas and the sasanquas are magical plants in SC, blooming for months on end with only a little care. We must be lucky then, we have quite a few and they don't need much attention at all. At one time, about 150 yrs ago they were only grown in glass houses as they thought they weren't hardy, eventually they found that they were hardy.Our soil is just the acid side of neutral and I've never had a problem. We are spoiled in Portland, since camellias grow like weeds here. Our often-acidic soils help, too. I wish I could promise you some camellia blossoms for the Garden Blogger's Fling next summer, but they'll be long gone by mid July. Do I remember you have a greenhouse? Perhaps a camellia would thrive in a good-sized pot if it had that kind of winter protection. Camellias are beautiful and I enjoy seeing them at the Smith College Lyman Plant House - the only place they will thrive around here.